Caption slip reads: "Photographer: Richardson Jr. Date: 1951-06-18. Reporter: Stewart. Assignment: Baby picture for soldier in 40th Division in Japan... wife at 636 Barbara Avenue, West Covina. 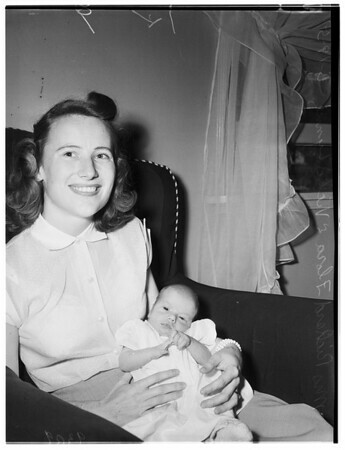 9-10: Mrs. Richard H. Flora, 21, holds her baby girl, Vicki Lynne Flora".